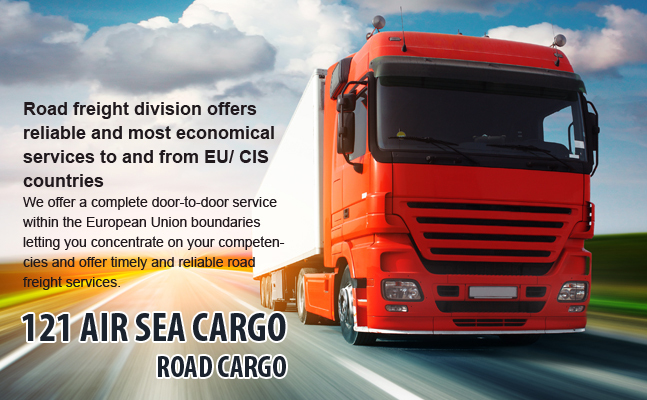 121 Air Sea Cargo Ltd.’s Road freight division offers reliable and most economical services to and from EU/ CIS countries. We offer a complete door-to-door service within the European Union boundaries letting you concentrate on your competencies and offer timely and reliable road freight services. We also offer services from consolidation part load consignments through to full loads, covering all of Western and Eastern Europe on daily direct services. Next day delivery service to majority of European destinations. To know more about our worldwide air freight services, Please drop an email at info@121airseacargo.com or call us at 020 8313 1777 and one of our specialists will get in touch to discuss your requirements shortly.